This is a very basic over view of some of the most common TTouches. It is here to give people a starting point if they are trying to find out more about this work over the internet. I have listed some more research rescouces at the bottom of this page. TTouch is now right at the top of my 'toolbox' and frequently used as a starting point to ease aggressive, stress related and boistrous behaviour, as well as easing discomfort from physical problems. It eases the way in a retraining programme and also gives the owner a way to make a positive connection in what has frequently become a dented relationship. 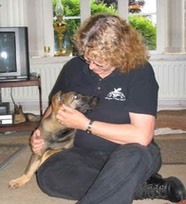 TTouch is also a huge part of our puppy and dog training courses. TTouch body work is a wonderful way for the family and dog to form an even closer bond and if the puppy or dog is confident when physically handled he is more likely to be happy and more confident when visiting the vets or the grooming salon. The groundwork exercises are brilliant for helping dogs to learn to walk in balance and walk nicely on a loose lead. With practice and experience, the TTouches used become more intuitive. The hands seem to just know where to go and which TTouches to use. If an animal is anxious about physical contact it can sometimes help to just sit quietly with him for a while, waiting for them to accept your physical presence. It helps if they are 'attached' on a long loose lead. It is important not to focus too attention by looking directly at or speaking to the animal much in the 'need to help this poor animal' as it can get the sense that you are too intense and this pushes them further away. When an animal is very reactive and touch sensitive, wands, a piece of sheepskin, cotton sock or towel can really help them to begin to accept TTouch. ALWAYS work at a pace that the animal can cope with. Practice the most common and basic CLOUDED LEOPARD TTouch on your own arm. Think of a clock face with 6 o'clock always the closest to the ground i.e. the lowest point of gravity. Curve your fingers slightly and using the pads of the first three fingers, gently move the skin in a clockwise direction all the way round to 6 and on to 8/0 o'clock. You will have completed one circle and a quarter. The thumb should be held apart from your fingers, gently rest it on the animal and keep it still to balance the movement of your fingers. When you have completed one circle and a quarter lift your fingers and thumb and move to start another. It is essential to keep your hands relaxed and as you learn, sometimes you can be concentrating so hard that your fingers become a little tense and start 'digging'. Remember to breathe - it's easy to forget and hold your breath when you are concentrating and this stiffens your whole body. The pressure needs to be just sufficient to move the skin gently. Avoid sliding over the skin as this can be really irritating - care needs to be taken with long coated animals or the human head (... well assuming it's got hair!). If you have a friend or partner who is prepared to help, you can obtain useful information about your progress in learning the TTouches. Get feed back on how it feels if you don't complete the circle or press too hard or don't breathe evenly - this can really help to improve your technique. The basic circles can be practised all over the body and have different animal names, dependant on the which part of the hand and/or fingers are used. The CLOUDED LEOPARD uses the pads of the first three fingers, ABOLONI uses the palm of the hand, BEAR uses the nails, RACCOON uses the tips of the fingers and there are many more. The size of the circle is dependant on how loose the skin is in a given area. Remember to move after each completed circle. It can be very irritiation if you continue to circle on the same spot. When you feel ready to work with an animal, pick a quiet time so that you can make a connection with each other. It helps to gently rest your other hand on the animal to connect the assist with your own physical balance and ensure that you do not lean any weight on the animal. Begin by gently but firmly running your hand all over the body, ensure that your breathe evenly and observe the animal carefully. Try to be aware of what he is trying to show you, he may move away from your hand as you touch certain areas, respect that and make a mental note of where the animal feels comfortable or less comfortable being touched. If the animal is anxious and moving away from the palm of your hand, he may feel more confident if you turn your hand over and touch him with the other side. It holds less heat and also many animals have experienced being grabbed and held by human hands so are naturally suspicious. Find a nice, safe, comfortable area of the body to begin your circles. As the animal becomes more relaxed TTouch the sensitive area fleetingly and quickly move back to the 'safe' area, almost before the animal realises what has happened. He will quickly understand that you will not push them past theri comfort zone and relax to your touch. Prepare to take time and maybe a few sessions building confidence in you. If the animal is extrememly sensitive, work for a couple of minutes and give time out, then work briefly again etc. Are generally enjoyable, very calming/comforting and helps with nausea. This TTouch is excellent to use when there has been trauma and can prevent an animal (or human) from going into life threatening shock. It helps when an animal is waking from a general anaesthetic as it eases the way back to consciousness. You can use three different ways to work the ears. Using thumb and index finger of one hand, while gently supporting the head and base of the ear for flop eared animals, slide gently but firmly from base to tip. Making sure that you stroke right off the tip of the ear to release any tension that has followed your movement. Repeat until you have worked over the whole ear - then work the other. If the dog is very stressed, it can also help to shake your wrist occasionally to release any hand tension you may have picked up from the animal. Turn your shoulder away to keep well away from their face. Small circles, gently moving the skin between finger and thumb in a circle and a quarter and working from the base of the ear to the tip in vertical lines. Move up after each little circle until you have worked the whole ear, then work the other. Using the tips of the fingers, make small circles and a quarter all around the base of the ear. Moving after each little circle. There are many acupuncture points in this area and this TTouch seems to stimulate them in a helpful way. Are used on larger areas where there is alot of skin movement. This is a lovely introductory TTouch for an animal who is very tense. The palm of the hand is used to make the circles rather than the finger tips. It is also used in combination with the PYTHON LIFT (below) and is great for tension release. This is a good TTouch to use where the CLOUDED LEOPARD seems too intense to begin with, or on larger areas where there is more skin movement. It uses all of the fingers, rather than just the finger pads. This is a gentle upward lift rather than a circular motion. Among it's many uses it can help to bring an animal into a state of mental and emotional balance. The whole hand is placed on the body with just enough pressure to GENTLY lift the skin, breathe as you lift, hold for a few seconds and then slowly return the skin to where you started, breathing out slowly as you do so. Help with fearful or excitable behaviour to aid relaxation, improve focus and restore emotional balance. Sit so that you are behind the animal's head, cupping the muzzle gently. 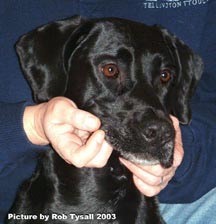 Stroke back along the muzzle, taking great care not to pull the whiskers. Circular touches all over the top of the head and muzzle are a great preparation. Move after each circle. As the animal relaxes and accepts this, with your thumb on the outside, curl your fingers and gently slide them under the lip. Slide fingers and thumb down simultaneously to gently release tension int he lips. Smalle one a a quarter circles with one finger tip inside the mouth, all around the gum line can really help to release tension. Keeping the tail in a straight line with the body, stroke down a few times to introduce touch to this area. With one hand near the base of the tail gently circle the tail, first in one direction a few times and then the other. To finish, slide your hand down the tail in gentle pull and hold movements. Also work RACCOON (finger tip circles) TTouches all over the tail. TTouches all around the hind quarters and tail is really helpful with fearful behaviour and sound sensitivity. Can be done using the hands linked under the belly. However, a folded towel or even better a wide ACE Wrap are preferable as they distribute the gentle pressure more evenly. Start just behind the front legs and gently lift the abdomen, hold and then slowly release, remembering to breathe as you do so. Move a few inches back and repeat until you are as close to the hind quarters as is comfortable for the animal. This is a lovely TTouch for animals with digestive problems, sore back, anxiety etc. Some long coated animals are less comfortable with the usual TTouches. Take a small clump of hair near the base, move the coat gently in one and a quarter circles and then gentley slide the fingers off the end of the hair. Is very important when using TTouch. Remember that this is something that you are doing FOR not TO the animal. Think positive and gentle thoughts, work for now - don't think in terms an end result. Meet the animal how it feels today, not how you wish it felt. He has to know that you are trying to help and will be pleased with any improvement you can make together - however small. This gives a basis to build on and the results can be amazing.